I'm trying to help out my office landlord, who is having issues with condensation on the hydronic system in the small office building. The boiler is a new-ish Lochinvar CBN090, connected to a bunch of baseboard emitters. 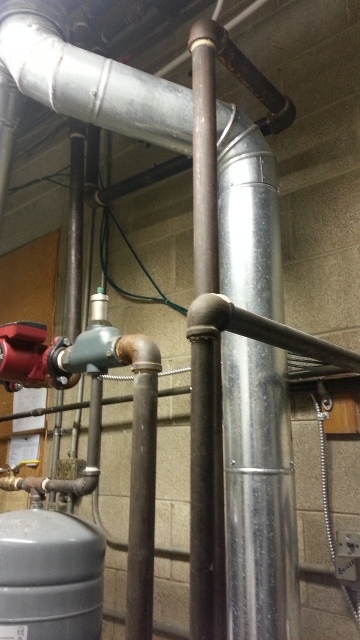 Half of the system is likely original to the building (1940's), with the back half added when the boiler was installed (the back half of the building was originally a workshop area). He's been having problems with the boiler cutting out because of buildup, requiring cleaning. The tech he's had out has determined that the problem is due to the return temperatures being too low, causing condensation. He's recommended either blocking off some of the baseboard (with aluminum foil) or installing a Lochinvar low temperature mixing valve and converting the piping to primary/secondary. It seems to me that the mixing valve is a bandaid solution. I've noticed a couple of other issues that could be contributing to the problem: none of the pipes have insulation, and the boiler seems oversized (it is on maybe 20% of the day, and only runs for 10-15 minutes at a time). However, the boiler tech didn't think that either of those were the problems (in fact, he disagreed that the boiler is oversized). I also wondered if adding outdoor reset to the boiler could help (to increase run times), but he said it would make the problem worse. Thanks in advance for your advice. I've gained a fair amount of boiler knowledge, but it's mainly centered around the Viessman mod-con we recently installed in our house (which loves cold return temps). How much damage is there to the HX and venting? Is the outdoor temp sensor installed? As of yet, I don't believe there's been any damage to the heat exchanger or venting. The boiler has only been in operation for a few years. No outdoor sensor is installed. Looking at Lochinvar's literature, it looks like outdoor reset is now standard on this line - was that not always the case? 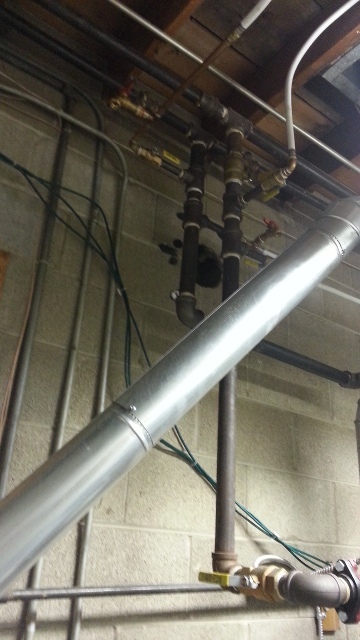 Of near boiler piping would help in determining a solution. Is it piped bypass boiler protection? The condensation can be cause by several things. Short boiler cycles, high mass radiators, long uninsulated flue, inadequate circulation. It's tough to get a good overall picture of the system, as the room is very small. Here are a few. The last picture shows a bypass loop that was installed earlier. Hope these help - let me know if I can clarify anything. It looks like your bipass is a pressure differential bipass. You need a thermostatic type valve to assure the boiler will run above it's condensation point. 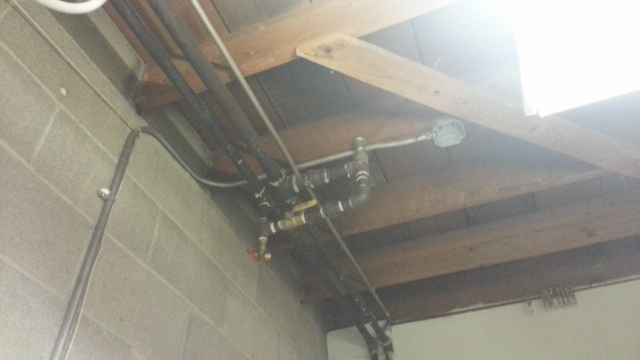 Coupled with zoning which is why you have a differential bypass valve. So your boiler short cycles because zone loads may be small, and boiler is oversized for the load. Maybe not for total load if all zones are calling. So Carl's advice is what needs to be done. 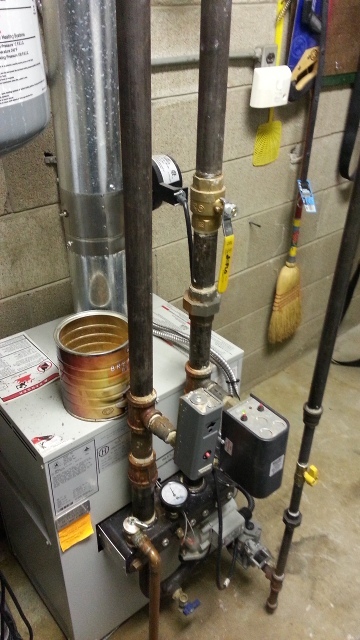 Install the ESBE valve to assure high return temps to the boiler.